During the early days of comic book character development, what about NYC made it such a fertile ground for superheroes? On the one hand – what an inspiring city, at all times, but in the late 30s, it was really a fast-paced exciting place to be. Modernism had come to be elevated in NYC – dance halls, Coney Island – a lot of movement, a lot of color, a lot of action, and at the same time it was a tough place to be because the Depression was still going on, World War 2 for this country was on the horizon, and for the group of men who were creating the first generation of superheroes, most of them were the sons of Jewish immigrants, it was hard to find work, no one at The New Yorker was going to hire them and they were really talented, really creative, and they hustled. The first gallery of the exhibit traces the characters’ origins; what kinds of artifacts are used to showcase this? We chose Superman, Batman, Captain America, Wonder Woman, Spider Man, and Iron Man. For each of those, we have the first time they appeared. We give the audience a glimpse of the actual comic book and factoids about each of the characters. There are drawings by Joe Shuster and Jerry Robinson for Superman and Batman, and we’re also really happy to have two drawings that Steve Ditko did for Amazing Fantasy #15 which was when “Spidey” came to be and these are gorgeous drawings lent by the Library of Congress, which they’ve never left before. We also have, which is really cool, the typewriter that Jerry Siegal [co-creator of Superman] used to type on the train travelling between Cleveland and New York. After the viewer has an understanding of the roots of these characters, what is explored next? The next step is media, so we start with radio – Superman got a radio show in 1940 and is the only superhero to have a radio show. We’re also showing a gorgeous 1941 animated cartoon of Superman, and what’s special about that is that at a time when five or ten thousand dollars was being spent on a 15-minute animated cartoon, fifty thousand was spent on that. For film serials, we have a video montage of the Batman movie [and] Superman 1948 movie. Then we move into television, so we have a Superman television clip but we also have the costume that George Reeves wore and for Batman 1966 we have incredibly gorgeous paintings that the art director did for set designers to prop and paint and create scenes. Another story that we’re trying to tell in the second gallery is not just how characters started to have a wider audience in the U.S. but also around the world. It really started in World War 2 with GIs carrying the American comic books featuring superheroes overseas, and then with the media it added to that and then also with publishing in other countries in different languages it just continued to exponentially grow. Do you think their New York origins aided this cultural crossover? I think it was the talent of those people to create these amazing characters that everyone loved and could relate to and wanted to be that made them go first national and then international. I don’t think it’s because it’s a “New York” creation but I think they were really good because they were made in New York. It’s where the publishing was and people transformed that into a world where there’s an individual character, a superhero has its own comic book. That had never happened before. Superheroes have had a great influence on the wide-range of New York based artists, cartoonists, contemporary comic book creators and fans. What’s on view to represent this? We have a Philip Pearlstein painting of Superman we borrowed from MoMA. We also feature cartoonist Mort Gerberg who works for the New Yorker and many of his cartoons feature superheroes. He lent us the prayer books that he used in Hebrew School, which he’d doodle images of Batman in from 1940. 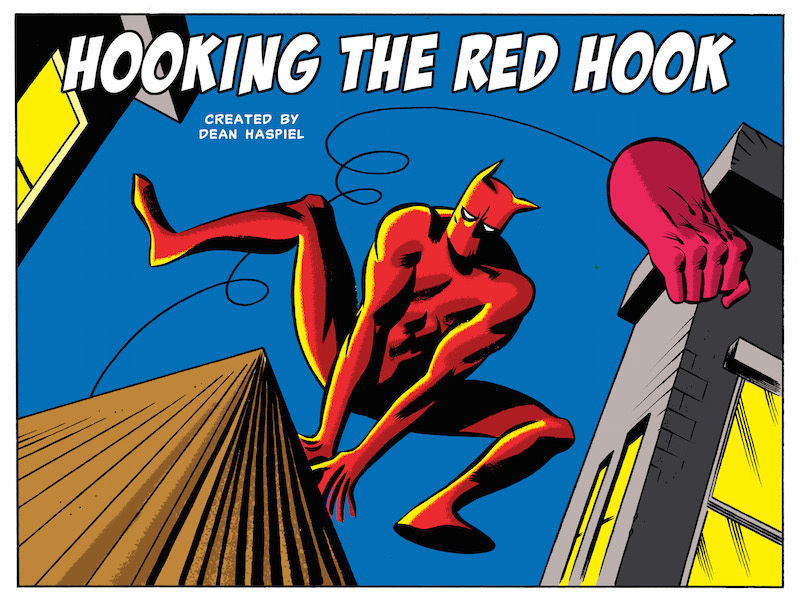 And there are other instances of more contemporary artists – we feature the work of Dean Haspiel who has done a character “The Red Hook” – Red Hook then inspired “The Fox” which he does for Dark Circle [Comics]. D.M.C. – Darryl McDaniels of the hip-hop group Run-D.M.C. – he started a company last fall called “Darryl Makes Comics!” and he hired well-known comic book artists to do the art and the characters based on his life in Queens in the 1980s. In terms of influence and inspiration, we specifically look at New Yorkers because we start in New York, we go national and global, and then we want to come back to New York.